And we're back, continuing on from Part 1. 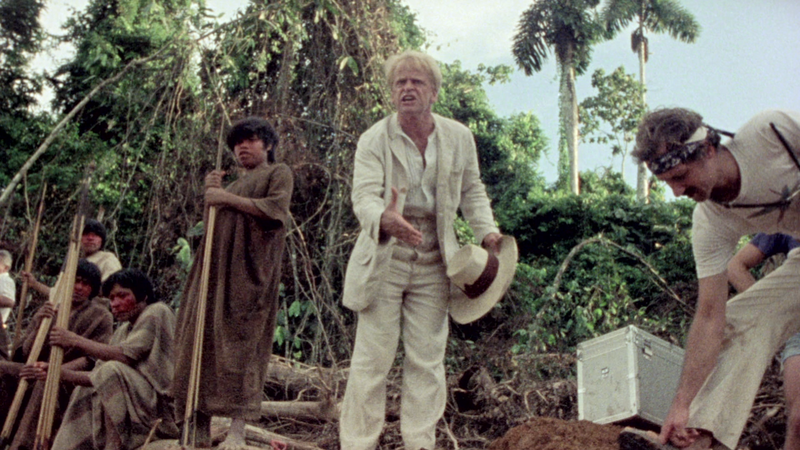 Feel free to use the above image as a checklist as we slide into the fourth of Werner Herzog and Klaus Kinski's films together, 1982's Fitzcarraldo. And again, we get a very different Kinski - he's actually smiling! He laughs, happily married (to none other than Claudia Cardinale) and cheerful. Who knew he even had that in him? haha But what we did know he had in him was a mad drive, which he lets lead him into an impossible mission. 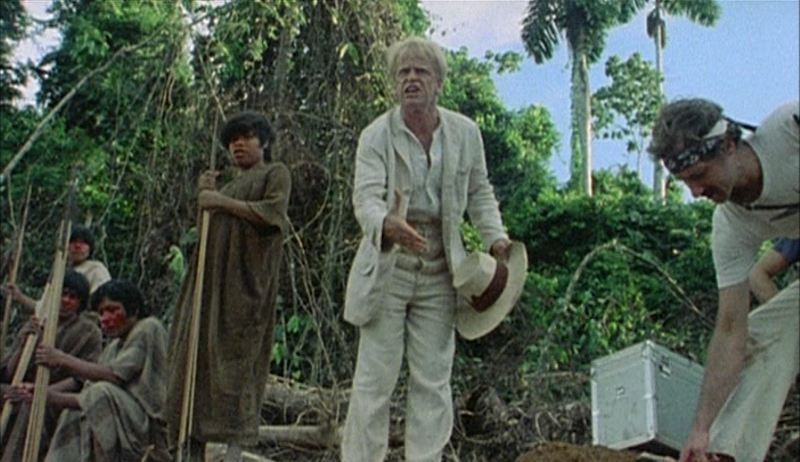 As an aspiring rubber baron in the early 20th century, he decides he can open a new route by dragging a massive steamship up over a jungle mountain, all in the name of bringing opera to the Amazon. But what really sells this movie is the physical production. If the authentically captured adventure of Aguirre's journey through the jungle blew your mind, this aims to top it. A cast of hundreds hauls this steamboat up an actual mountain only to then ride it through very real, deadly rapids. The story behind the film might be more compelling than the one in front of the cameras, but the complete absence of special effects of any kind keeps the line between the two fascinatingly thin. 1) 2004 AB DVD; 2) 2014 SF blu; 3) 2014 BFI blu. Once again, stepping up to blu gives us a big jump in clarity. Anchor Bay's 1.81:1 aspect ratio gets corrected to 1.85:1, with some additional framing adjustments. Just looking at the two sets of shots I picked here, you can see the first set is quite close, but the second set pans noticeably to the right (and a bit more on the Shout than the BFI). This time, happily, black crush is not an issue. 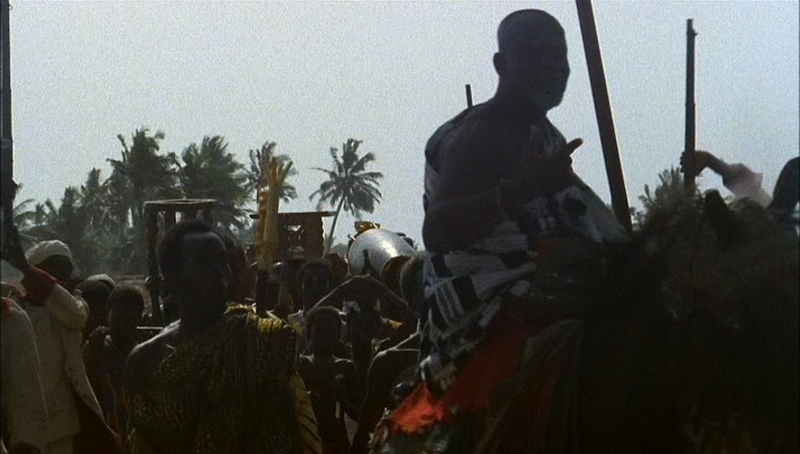 In fact, ironically, you can make out a hair more in Shout's shadows than BFI's. On the other hand, though, grain is much more natural on the BFI blu, whereas it looks like Shout's been DNR'd, rather reminiscent of what we just saw on Blue Underground's Living Dead In Manchester Morgue blu. SF blu left; BFI blu right. See what I mean? So BFI still wins out between the two, but by a different set of standards. Audio-wise, we're sort of back to our earlier examples, with 5.1 and mono mixes of the German audio, but this time Anchor Bay also came up with a 5.1 mix of the English track, in addition to the mono. But the Shout Factory drops that one, just giving us the two German mixes and English mono in 5.1. BFI brings back all four mixes, though, with the 5.1s in DTS-HD and monos in PCM. So the original mono mixes are what's really important, and they're on every version. But if you care about the 5.1s, that's another point lost for Shout. Oh, and yes, all three discs have optional English subtitles. In terms of extras, things start out predictably. Anchor Bay just has the Herzog/ Hill commentary, which is as rewarding as ever, plus the trailer and a photo gallery. 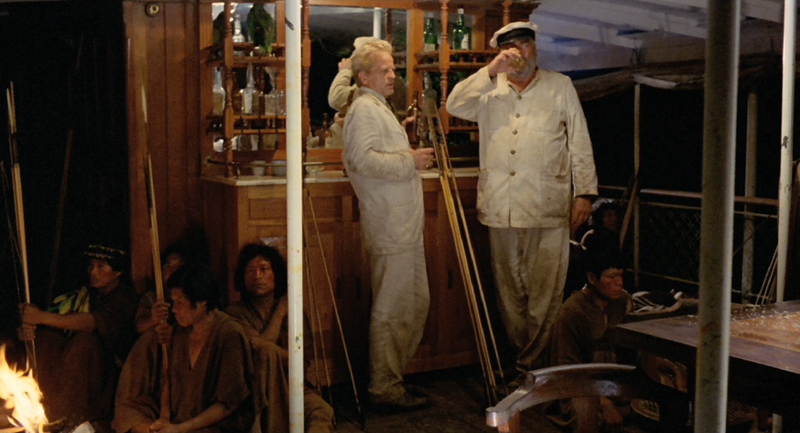 Both blus carry all of that over, but only Shout has the second audio commentary with Herzog and Straub. However, Shout doesn't win this round, as BFI has two big aces up their sleeve. The first is an exclusive, hour-long, previously unreleased British documentary filmed during the making of Fitzcarraldo called The South Bank Show: Werner Herzog. 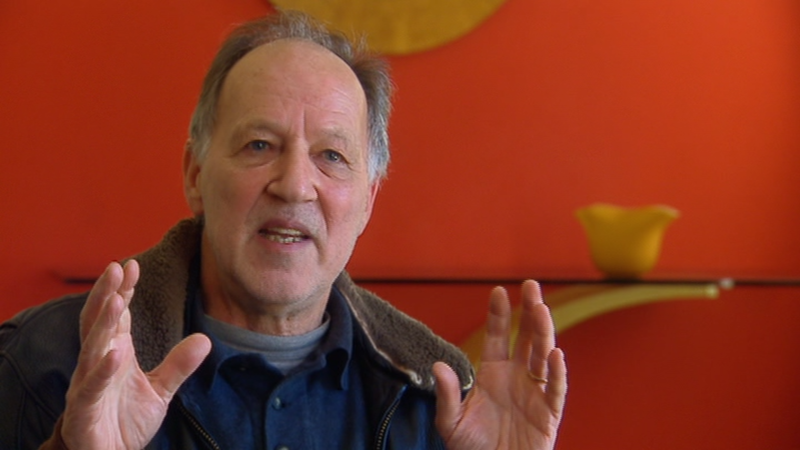 It's a bit more generally about Herzog than this film in particular. But that's okay, because they've got that angle thoroughly covered with their second ace, Burden of Dreams. 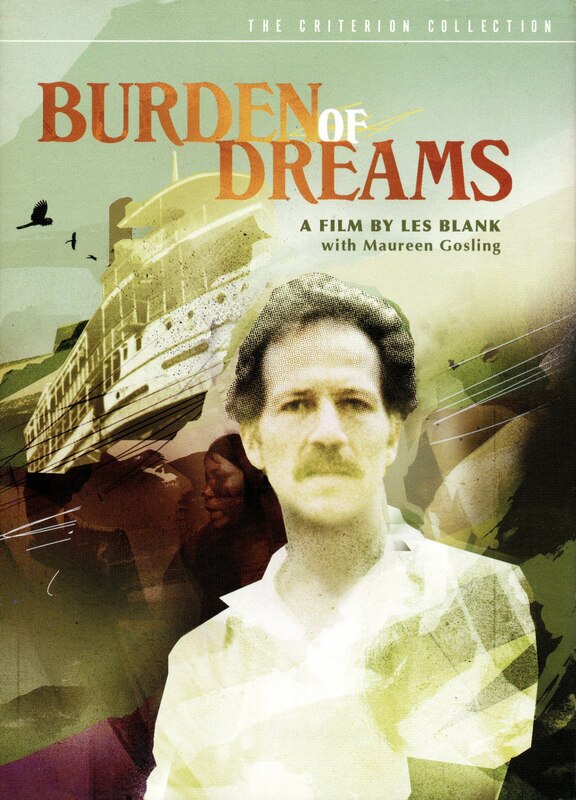 Burden of Dreams is a feature-length documentary by Les Blank filmed on the set of Fitzcarraldo. Like I said, the story behind that film is more important than the actual plot, so this is an important and extensive look at the absurd lengths they went into capturing these images on film. 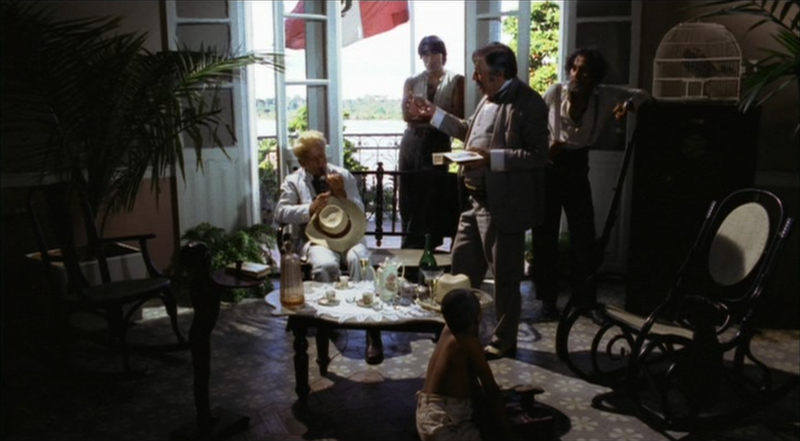 In fact, at least for myself, moments from the doc are indelibly married into my memory and appreciation of Fitzcarraldo itself. From the wild footage of Herzog, Kinski and their cameraman being thrashed around on the rapids to the surviving footage of Mick Jagger and Jason Robards in the original, lost version of the film. They essentially make one ultimate, double-film, each of which feels incomplete now when I just watch one or the other on their own. 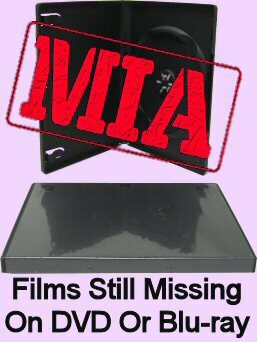 It's such a compelling documentary that Criterion released it as its own separate and distinct DVD entry for their collection in 2005. It's probably because Criterion has it, actually, that Shout couldn't include it. But even though Criterion reissued Burden in 2016, they still made it DVD-only, though BFI has it on blu in their set. 1) 2005 Criterion DVD; 2) 2014 BFI blu. 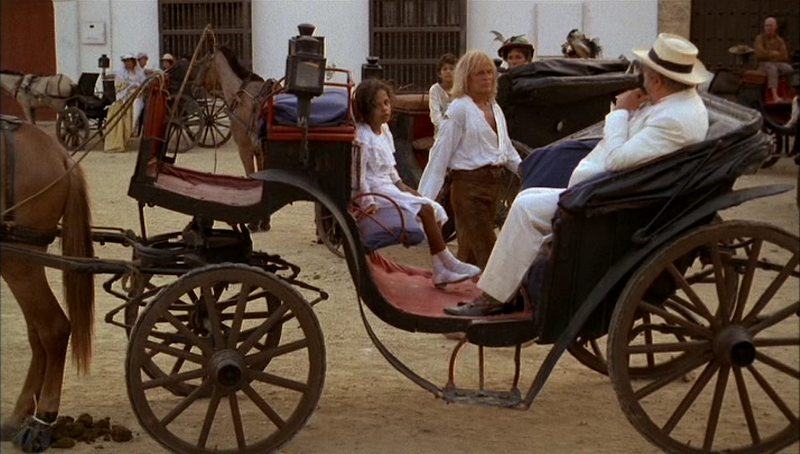 It's a fullscreen film, presented in 1.33:1 on both discs, though as you can see above, it sometimes shifts to non-anamorphic widescreen when presenting shots from the feature. Burden was shot in 16mm, so it naturally looks pretty low-fi, and BFI seem to be using the same master Criterion made ten years earlier. So, it's not an upconvert. The increased resolution of the BD does give you a little extra sharpness and clarity; but the movie is light enough on detail that you probably won't notice the difference without doing a direct screenshot comparison like this. And even then, I had to zoom in and look pretty closely to confirm for me that it was boosted. And both discs just feature the original mono track (in LPCM on the blu) with optional English subtitles. But there is an important distinction: Criterion's release is packed with special features. 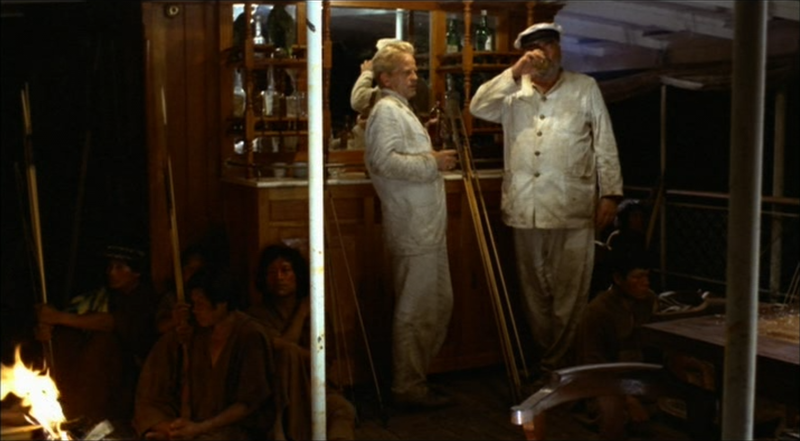 BFI's blu is, for all intents and purposes, barebones, because for them Burden is itself pretty much an extra. 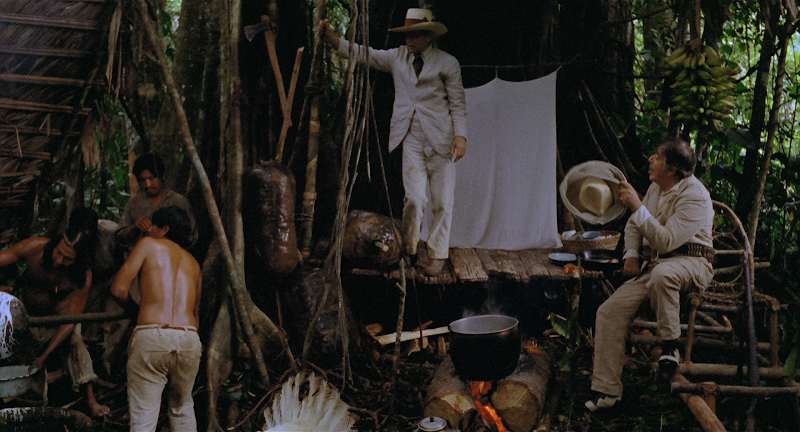 But Criterion cooked up an audio commentary with Blank, Herzog and sound recordist Maureen Gosling. It's pretty good, not quite as interesting as the ones on Fitzcarraldo, but that may be because - after the film, its commentaries, and this doc - a lot of anecdotes start to repeat. But there's more, too, including two deleted scenes and a lengthy on-camera interview with Herzog. 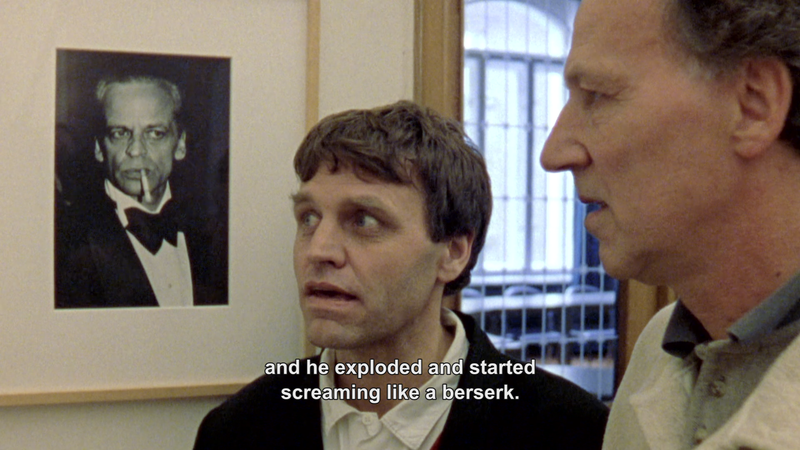 They also throw in the trailer, a stills gallery and the short film Werner Herzog Eats His Shoe, that Blank also directed, and which actually is included on the BFI set, too. 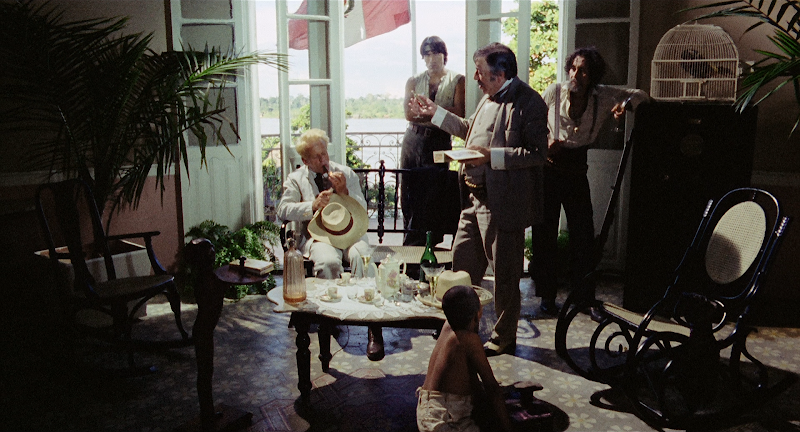 That short has nothing to do with Fitzcarraldo or Burden, though, and makes more sense paired up with Gates of Heaven, which Criterion also packaged it with (see that review for more). Criterion's DVD also comes in a nice slip box and includes an 80-page reproduction of Blank's filming journals. In short, Burden is a nice selling point for BFI's box over the Anchor Bay and Shout Factory ones; but you still may well feel the need to cop the Criterion edition anyway, which would render it much less of a big deal. 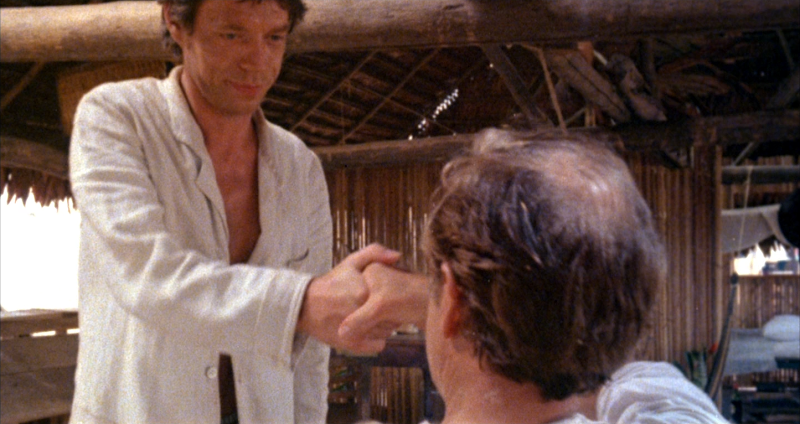 We jump ahead five more years to Herzog and Kinski's final film together, Cobra Verde. Here Verde is a hardened, merciless bandit, an antihero straight out of a Western. 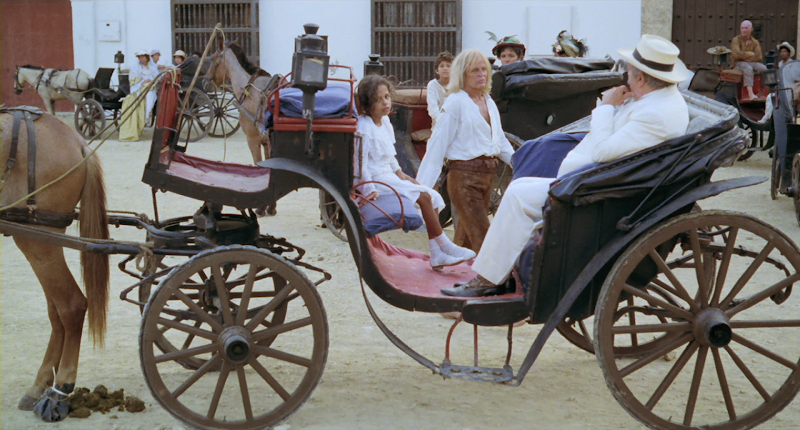 But lest you think anything in their body of work is predictable or cliche, we soon find our protagonist's journey taking a strange turn to Africa, where he's sent to take over the post of a murdered slave trader. 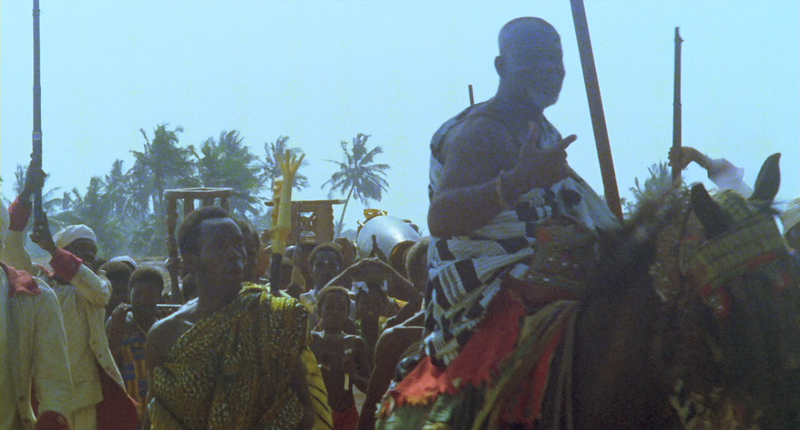 Herzog really leans into spectacle here, where actual local kings play themselves and have their people dance and perform for the camera. Cobra Verde is an interesting blend of two distinct Herzog styles, where he's exploring with one eye, shooting exotic customs as he finds them, yet staging massive, epic-scale productions for the other. 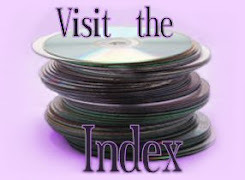 The film dances between authenticity rival film makers could never hope to capture and fantastic, fabricated ballyhoo. 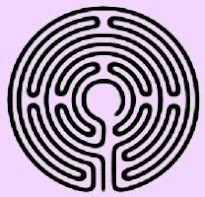 The plot and characters are a little threadbare - I have a feeling I wouldn't be too impressed with the novel it's based on; not to mention that it's not always easy to maintain empathy with a racist slave monger. So in that sense it's a bit like watching Elizabeth Taylor's Cleopatra, where you're on board more to be impressed by the show being put on for you than to really sink into the story being told. There's a bigger shift in aspect ratios on this one, going from 1.76:1 to a wider 1.85:1 (or even 1.86 in the case of Shout) on the blus. I'm sure you don't need me to point out the significant gains in picture in the 2014 editions. The blu-rays both also lean to a cooler blue tone, which I'm not honestly sure I prefer, but I couldn't actually recommend sticking with the DVDs when you see how drastically over-compressed it is compared to the HD versions. Between the two blus, Shout's a hair too bright. Grain is a bit lacking in both cases, but again I'd give the edge to BFI. It's a slight edge, though. In this case, the two blus are very close. It's another familiar story in the audio department, with Anchor Bay offering 5.1 and mono versions of the German track, the English only in mono and optional English subs. This time around, Shout drops the German 5.1, presenting just the two mono tracks in DTS-HD, while BFI keeps all three tracks, in DTS-HD for the 5.1 and LPCM for the monos. 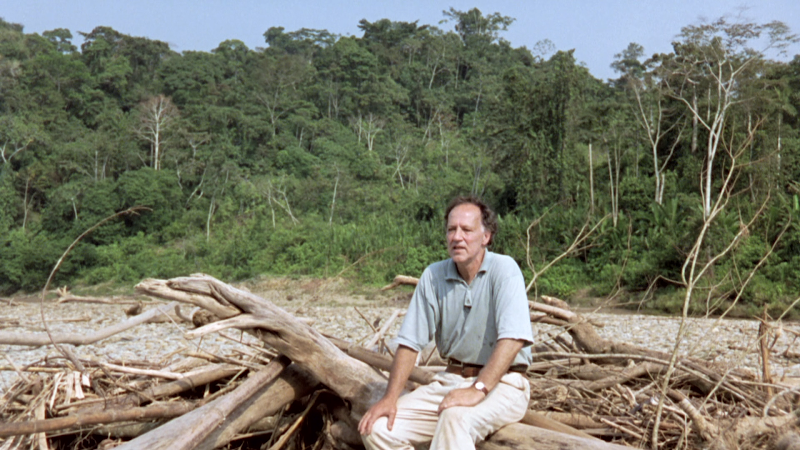 Extras are the same old story with the Anchor Bay set: a Herzog/ Hill commentary and the trailer. But things get more interesting with the blus. Shout once again keeps the AB stuff and adds an hour-long audio track with Herzog and Straub, plus a photo gallery. Even more exciting, they introduce a great little documentary to the table, aptly titled Herzog in Africa, which allows ride along, for 45 minutes, for the filming of Cobra Verde, and considering the utterly unique production, is an absolute must see. Unfortunately, BFI keeps the AB stuff but gets none of the new Shout stuff. Instead, though, they have their own exclusive: a very good, 90 minute Q&A with Herzog after a 1988 screening of Cobra Verde. They also had a second, German language trailer. So Shout has the best stuff, but BFI's exclusive is nothing to sneeze at. And that's it for the films they created together. 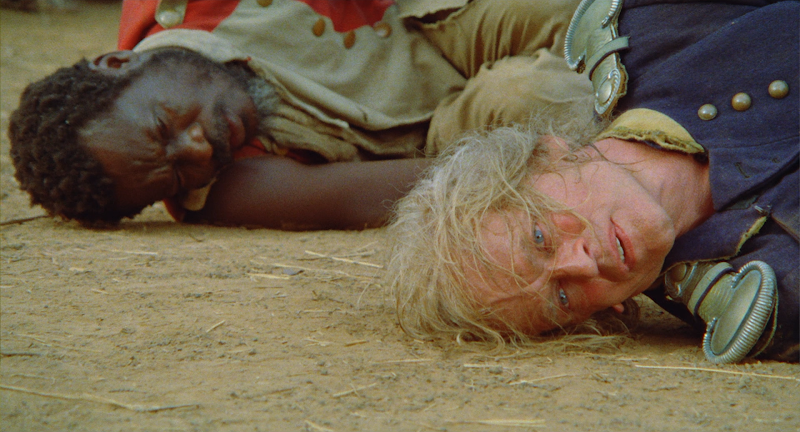 Herzog has over 70 films to his credit now, and Kinski has over 130. But these five stand out in both of their catalogs, and Herzog would reflect on their creative period and volatile relationship in his 1999 documentary, My Best Fiend, included in the Anchor Bay and Shout sets, but not BFI's. 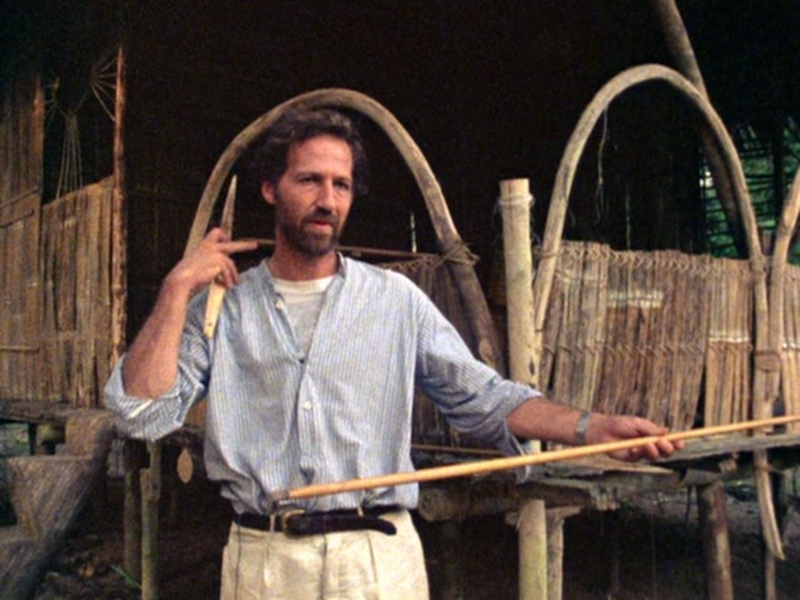 He revisits filming locations (yes, even those deep in the Amazon) and interviews fellow cast members to reminisce over Kinski. He showcases some great vintage footage (most noteworthy from Kinski's crazy tour as Christ) and returns to his childhood home. Kinski was a dynamic figure to the point of near insanity, and Herzog doesn't shy away from exploiting that here. By the way, I think it's worth noting that both deleted scenes from Blank's Burden of Dreams documentary are incorporated into this film in whole. Overall, it's a very compelling little doc, but it does feel a bit brisk, like it would be even richer if he'd've dug a little deeper. But you sure can't say what we've got isn't interesting as-is. 1) 2004 AB DVD; 2) 2014 SF blu. The film quality naturally bounces around as this film uses footage from multiple sources, including some pretty dodgy videotape. But in the higher quality stuff, either shot new for this documentary or taken from the feature films, you can't miss the benefits of the restoration and uptick to HD. It's 1.76:1 in both cases, but has clearly been re-scanned (from the 35mm interpositive) for much better image quality and improved framing. All that ugly compression of the DVD is washed away, the colors are more naturalistic... there's a slight bit of black crush, I suppose, but it's not too invasive. 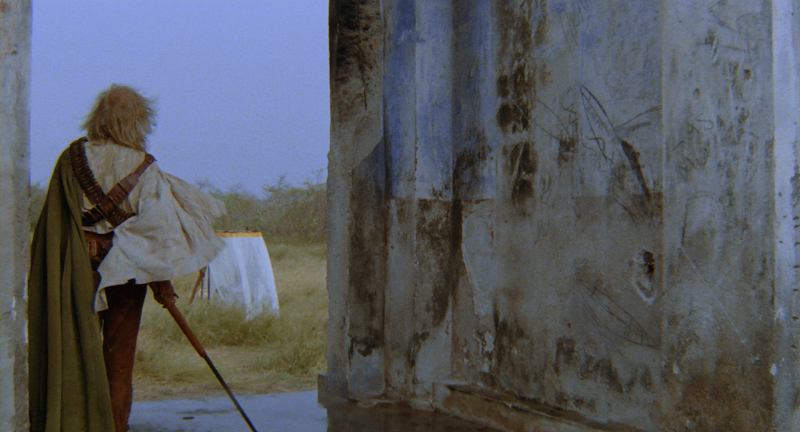 Overall, I was expecting a very minimal jump up from the DVD to blu, much like we just saw with Burden of Dreams. But no, I'm happy to report that it's actually a real overhaul. Both discs include both the English and German mono tracks (in DTS-HD on the blu) with optional English subtitles. The only extra in both cases is the theatrical trailer. So these are a brilliant collection of films, and absolutely worth upgrading if you've still got the DVDs. Even for DVDs, they really don't hold up so well. 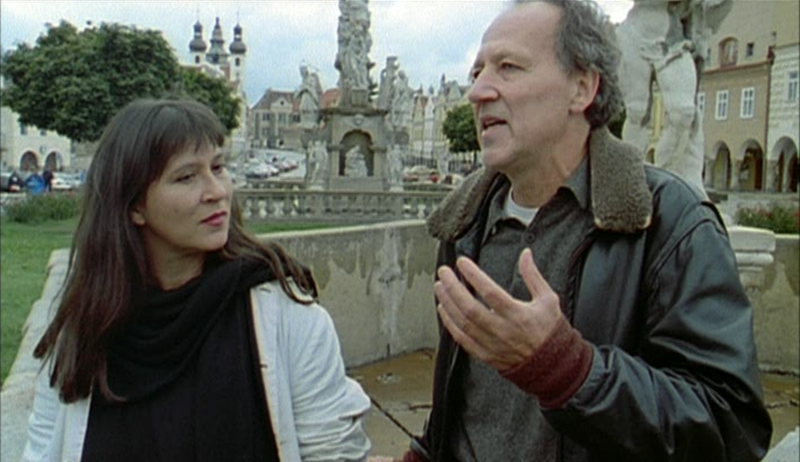 Overall, I tend to prefer the BFI transfers, but they both have so much unique content, including plenty of Herzog films and features not related to the Kinski collaborations, that you can't just declare a winner. Honestly, despite the overlap, I'd recommend both sets if you can afford it. And I'll be covering the remaining films in both sets down the road. But yeah, these bad boys ain't cheap, and many (most?) of these films aren't available on blu-ray individually; so you'll have to work out your own plays. But for my part, I can't say I regret any of the double(or additional)-dips I've done for these films.